There are a million things to experience in New York City, but this is one in a million. Located at the top three floors of the One World Trade Center, which is now the tallest building in the western hemisphere, the observatory boasts jaw-dropping views of Manhattan and its surrounds. With this admission ticket, you'll have access to all three Observatory floors for a memorable experience that offers fabulous photo ops, New York City history, and dining options to buy food or drinks high in the sky. Choose to upgrade to priority admission to skip all the lines with Priority Access security line and Express elevator to the top. 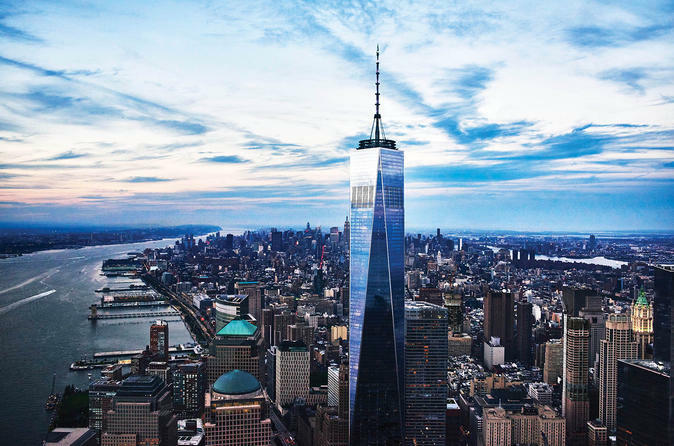 If you thought the elevator ride was cool, you'll be blown away by the One World Observatory's vantage point, which on a clear day, provides a sight line of about 50 miles (80 kilometers). Watch a video about the making of the 1,776-foot-tall (540-meter) skyscraper, and then look out the panoramic windows for one-of-a-kind New York City views. Upgrade your experience to priority admission to skip all the lines with Priority Access security line and Express elevator to the top.